This afternoon, peers will vote on amendments to the health and social care bill - a bill that threatens to destroy our NHS as we know it, reports Shamik Das. This afternoon, peers will vote on amendments to the health and social care bill – a bill that threatens to destroy our NHS as we know it. The bill is currently at the second reading stage in the House of Lords, which debated the bill long into the night and will resume debate this morning at 11. If this vote is successful, the bill would go no further in the House of Lords and could not pass into law in this session of Parliament. Were this amendement – which refers the entire bill to a select committee for what would be a line-by-line deconstruction – to pass, it would effectively kill the bill, something the Secretary of State conceded late last night; any changes would have to be reconciled with the version the Commons passed, which the Tories just would not accept. 10). There is no mandate – from either coalition party, from either party manifesto, or, as Lord Rea says, from the coalition agreement. 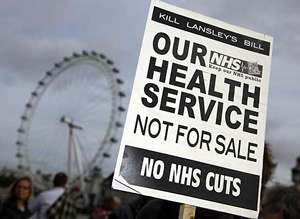 The success or failure of the bill, the continued success or future failure of the NHS, will be determined by Liberal Democrat peers, for whom it is crunch time: do they stand shoulder-to-shoulder with Nick Clegg or the NHS? As health budgets are squeezed, it will be more important than ever to have clarity on the underlying principles, such as where the buck stops. The coalition might have hoped to evade blame for problems that arise from the financial climate, but after the ruinous row over these reforms, every dropped bedpan will inevitably reverberate back to Whitehall – whether that is desirable or not. The descendants of a liberal party which helped to found the NHS now must decide whether they are prepared to risk a row to defend it. Capitulation here could carry a higher price than raising student fees. The stakes really are that high. Liberal Democrat peers must join their Labour and crossbench colleagues, do the right thing, stand up for the voiceless, the poor and the unwell, stand up to Nick Clegg and the Conservatives, say no to the reforms and vote, vote, vote to save the NHS.